Absolutely useless. This space is basically a small walk in closet. When we have three or four people trying to come in, it’s impossible for us to all hang up our items on the builder installed wire closet shelf. The kids can’t hang their own gear up because it’s too high so they just dropped things on the floor and it was just a mess all. the. time. We had some hooks on the opposite wall for the kids but they pulled out of the drywall and sat on the floor all summer taunting me…this is not going to work this winter…you need to do something…. And so I did. I pulled down that wire shelving and set to fixing the functionality of the space. 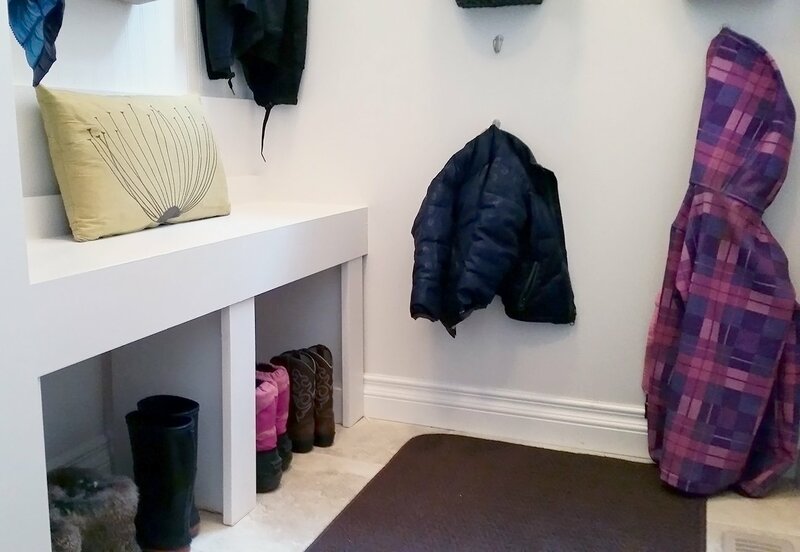 I couldn’t change the size of the mud room but I could lay things out so we had spots for everything we needed to put in there and I could make it so the kids could manage their own stuff. I started with a bench and I’m not sharing a how-to for this project because I’d never built a bench before and totally did this by the seat of my pants. It wasn’t easy but I did it! It’s sturdy and while I was feeling very inadequate about my carpentry skills, many sins were covered with caulking and paint and now that it’s finished I’m pretty proud that I did it all by myself. It provides space for someone to sit and be out of the way of others in the room and allows for us to tuck our footwear underneath. Each person has room for their boots or every day shoes. Other shoes will need to be kept in the front hall closet – there just isn’t room for everyone to have three pairs of shoes here but there isn’t need for that either. 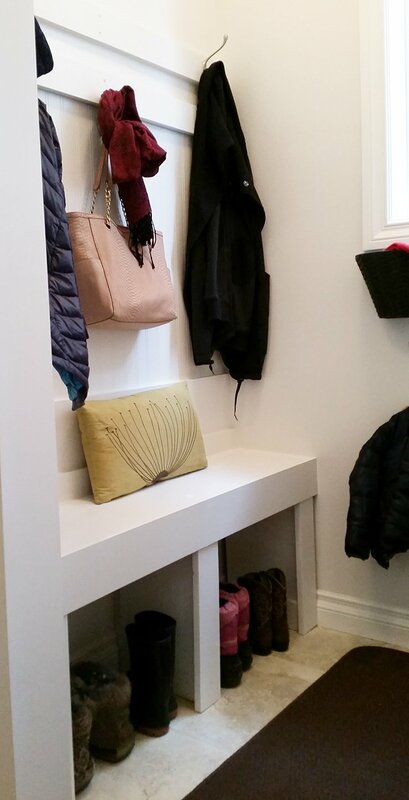 Above the bench, I installed some bead board and hooks. These hooks belong to my husband and I. Each of us has two hooks for coats plus there’s a center hook for my purse and scarves or what have you. 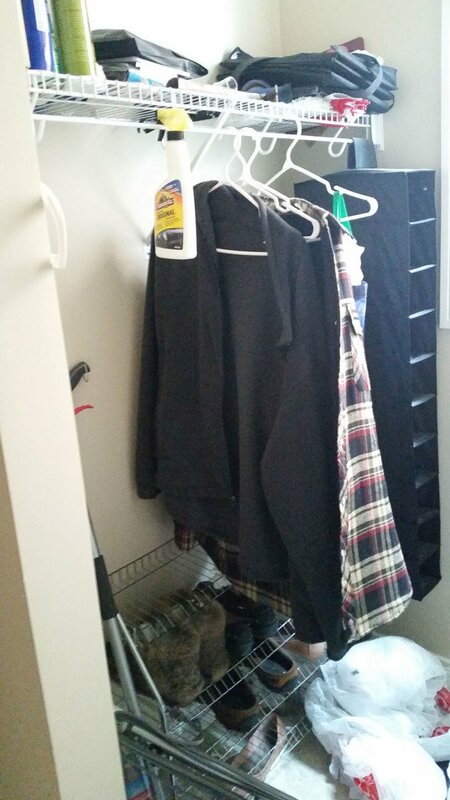 We each have room for what we need on a day to day basis and extra items will go in our front closet. 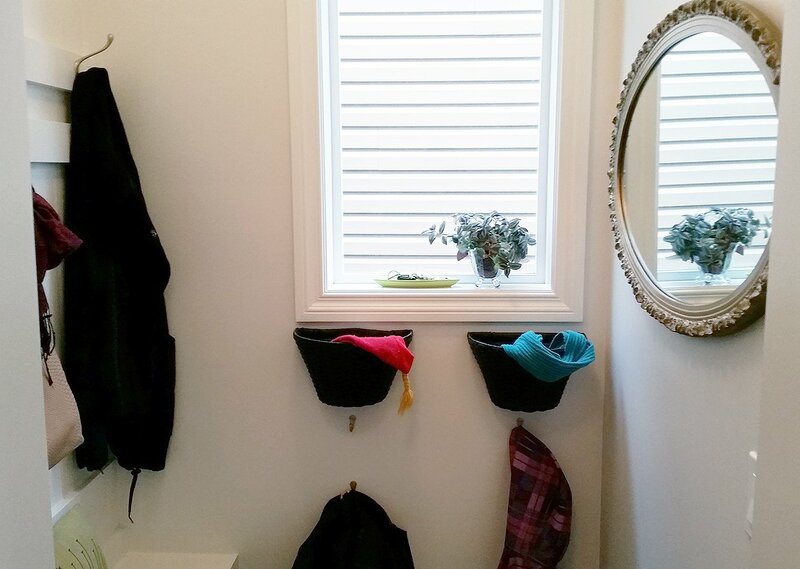 This mud room isn’t about storage – it’s about efficiency and organization so we can get in and out, without hassle. 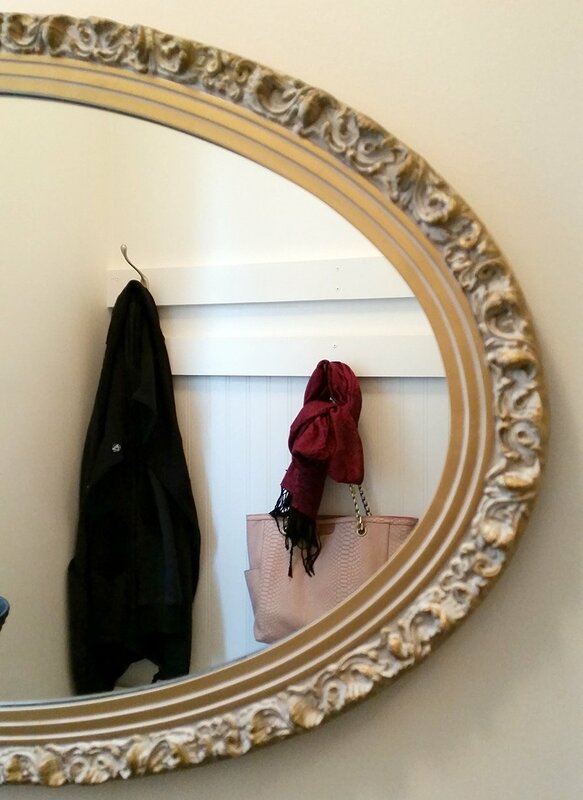 That mirror is a vintage one I bought at our local thrift shop and it sat in my bedroom for well over a year before I realized that it belonged in the mudroom. It makes me so happy when I grab something because I love it and then discover the perfect application for it down the road. It’s like karma or something. I painted the walls with the leftover Melamine paint from my Dining Table Makeover. I used it not because I wanted such a strong finish, but because I had so much left (I am horrible at gauging how much paint a job will take!) and didn’t want it to go to waste. Now that it’s up on the walls and I’ve lived with it a bit, it’s the ideal finish for a mudroom really. Zippers bouncing of the walls and water and mud will all have no effect. The space had been pretty beat up prior which is what prompted me to paint it in the first place. The kids kick their boots off and they bounce off the walls, they swing their backpacks willy nilly – it makes sense to have a paint finish that can take impact well. Over all I’m really pleased with how the space turned out. Now, instead of coming in the door to chaos and mess, I’m greeted with a bright, organized space that functions well. And it’s proof that small spaces can be functional too. We just need to look at them differently, see past what the builder installed and make a change. Fear of it not being perfect shouldn’t stop you from giving something a go either. I had a few extra holes to fill from my mistakes but the alternative of living with such a dysfunctional space was worth all the spackle and hole filler I used. I love it! Looks great and so functional!